Reading has always been important in our house and I’ve enjoyed the special bonding time it has given Caterpillar and I from when he was very young. As he now approaches his first year at school I’m excited to share the other side of the reading journey with him; helping him learn to read himself. As a childhood bookworm, this is so exciting for me but also a total minefield. It’s beginning to feel like a really long time since I was in primary school and a lot appears to have changed. Yes, we had colour bands on our books and it seems that principle remains but now we have phonics and word groups and many other terms that leave me a little baffled. I’m not concerned as I trust Caterpillar’s school to hold his hand (and mine) through this next step but there’s no harm in getting a little clued up in advance. 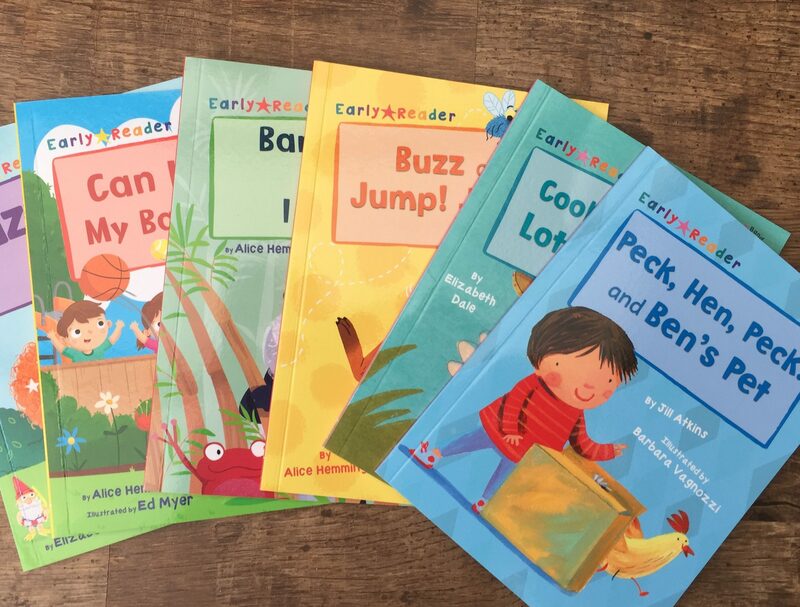 On this note I’m really happy to share these books from Maverick’s Early Readers series. Early Readers follow the same colour band system as schools, beginning at pink and going through to purple. I previously reviewed some of their orange and turquoise bands, from a purely picture book perspective, in this post but today we’re looking at some of the lower band books which my four year old may begin exploring in the next year or so. The pink band books each contain two stories each – we read Cool Duck & Lots Of Hats and Peck Hen Peck! & Ben’s Pet. 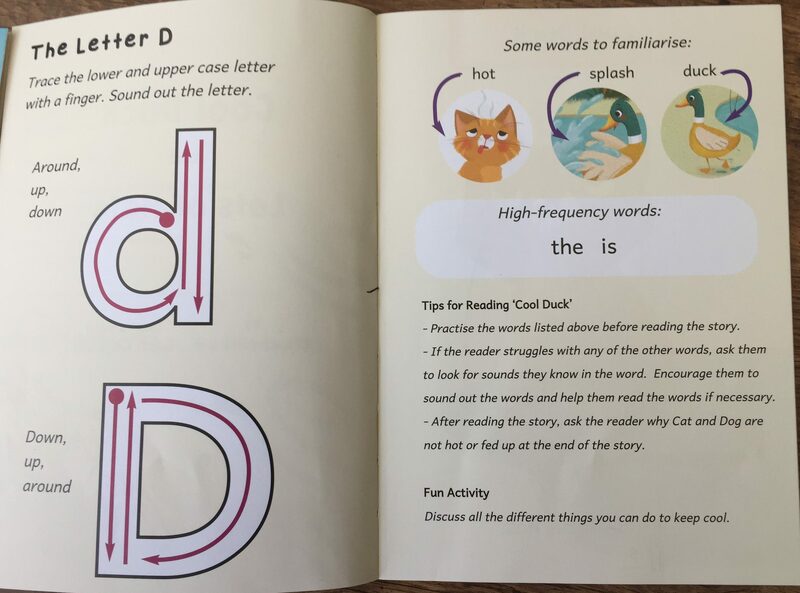 At the beginning of each story a key letter is illustrated in both upper and lower case, with helpful arrows to encourage children to know how to form the letter. This was especially handy for us even now as Caterpillar has just begun learning how to write his name and to copy other letters. High frequency words are also listed at the beginning, along with helpful illustrations to demonstrate. The simple story then follows, with one line per page accompanying a lovely illustration and sometimes speech bubbles too. Even though my son is nowhere near reading yet he has shown an interest in words and often asks what things say etc so this was a new type of reading experience for us where by I pointed to each word as I read it to help familiarise him. The red band books also contain two stories each with the same format at the beginning. We especially enjoyed Buzz & Jump! Jump! because, although obviously very short and simple, the stories still had a very clear plot and are fun and humourous. The repetition is really useful too. The yellow band books contain only one story each and don’t have the key letter and word sections at the beginning. Again, the stories are really cute. In Izzy! Wizzy!, Izzy is a wannabe magician who wishes for lots of items which don’t come quite true, it’s only when she uses “please” with her wish does she get what she wants (a lesson I’m still trying to drum into my son). I love the realistic storyline of Can I Have My Ball Back? and the surprise invention at the end. And as mentioned in my earlier review, the quizzes at the end are a great touch – my son loves doing them. Early Readers are a great series and I really look forward to Caterpillar reading them to me in the future. If you’d like to win a set of these six books please enter the giveaway below. Or to find out more about the Early Readers series visit Maverick here. Previous Previous post: Is Your Home Harming Your Pet? I loved The BFG, The Famous Five books and The Faraway Tree Adventures when I was young! I had the Beatrix Potters which I loved but I also had a brown hardcover book called The Three Little Kittens which I suspect is still around somewhere, stored away in a box, and appears to be still in print today. I loved the Famous Five books by Enid Blyton. I loved Goodnight Mr Tom by Michelle Magorian – I can’t count how many times I have read it. All kinds of emotions in one book. As for teaching children to read, I think exposure to good quality books from birth plays a massive part. If they love books, reading will follow when they are ready. Loved Noddy and his car. My daughter is starting Reception this September, looking forward to help her in her reading at home. The Very Hungry Caterpillar was my favourite in the infants. I think reading to children from an early age, visiting the library together, choosing books together :- Are all helpful in encouraging children to become interested in reading. Teaching them the alphabet, the sound / sounding of letters, words, then sentences. These are all helpful, as are nursery rhymes, songs, poems, etc. I loved Roald Dahl … I think patience helps because not all children get it at first. The Wind in the Willows was my favourite, I can’t wait until my little one is old enough to read it together. Roald Dahl and Enid Blyton were my favourites as a child. Enid Blyton’s first Famous Five book was my favourite but the children have all loved The Very Hungry Caterpillar as they grew up. My favourite book as a child was Enid Blyton’s, The Naughtiest Girl in School. I absolutely loved it and re-read it hundreds of times! My twin girls are five and I’ve already invested in some reading practise books and phonics books for us to practise with over the holidays, but would love some more. Great competition. I loved Enid Blyton. I make reading a lot of fun with my Grandson, I make the characters in books come alive with different voices. He loves books . I loved Heidi and the famous five. I loved the book called “don’t put your finger in the jelly nelly” I bought it for my kids the other week and they love it too! I always really loved the Brer Rabbit books by Enid Blyton. I loved all Roald Dahl books especially the twits. My favourite book was Enid Blyton’s Faraway Tree. I loved all the Roald Dahl books as a child and Nancy Drew started my love of thrillers! My little one is just 2 but is already reciting his favourite books so I believe finding something they love and reading it over and over helps them start to learn by recognising the words they’ve memorised. I loved My Naughty Little Sister and Milly Molly Mandy Books, that’s showing my age! !